This handy little clutch has eye-catching vertical stripes, and is just the right size to hold everything needed for a night out with the girls. What I like best about this pattern is its adaptability. 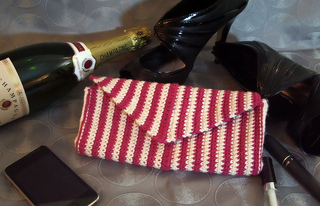 It can be made in one colour or lots, with or without a strap, with or without a button on the front.